It’s that time of year again! This Friday is Arbor Day across America, and for Massachusetts arborists it’s the Arbor Day of Service. Arbor Day of Service is a program developed by the Mass. Arborists Association several years ago. 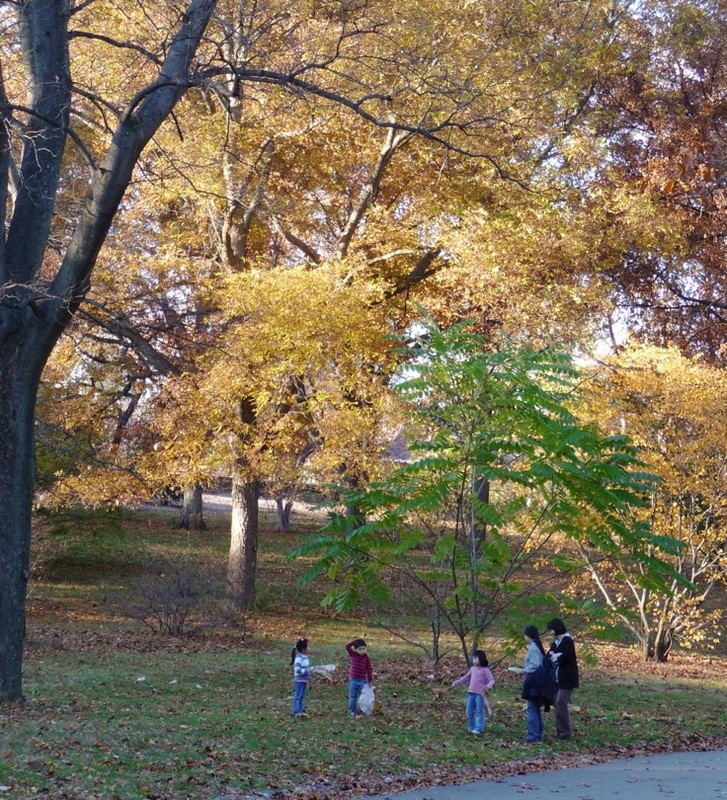 For it, the MAA “partners with local tree wardens, community leaders, and civic organizations to identify worthy projects in need of professional tree care”. Tree companies and individual arborists pick the project they want to participate in, and donate their time to plant, prune, and care for trees on the selected sites. It’s a great program; various organizations which otherwise might not be able to carry out the needed work at one time benefit from the Arbor Day of Service blitz approach, and the arborists team with one another to give back to their communities. Last year the arborists donated over $250,000 in services in that one day to the communities and organizations they chose. To read more about Arbor Day itself, check out the Arbor Day Foundation website. To find out more about the MAA’s Arbor Day of Service, take a look at the MAA website, which also has a signup sheet if you’re a member and haven’t yet put your name in to work on one of this year’s projects. The two projects I’m most aware of this year are at Tower Hill Botanic Garden in Boylston, MA (worth visiting whether you’re there to do pruning or tree care or just to enjoy the site and gardens) and at Boston Common, one of the nation’s oldest common open spaces. 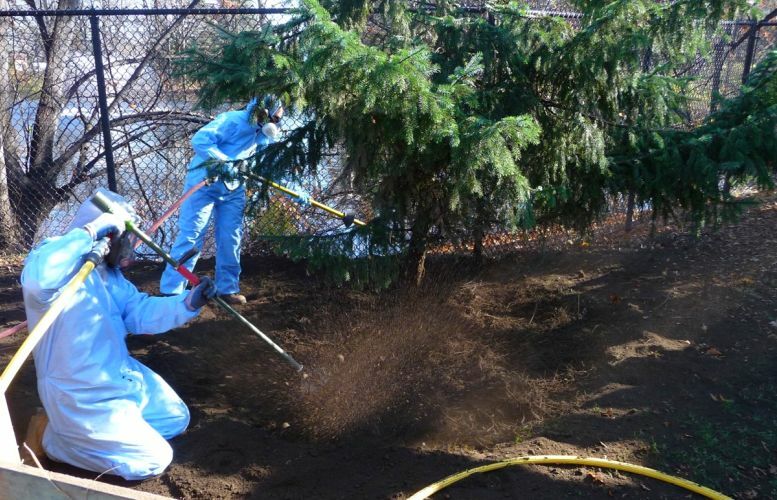 The Massachusetts Arborists Association has a new volunteer initiative starting in 2010. They aim to build on the traditional Arbor Day celebration by instituting a statewide volunteer service day on that day, which falls on April 30, 2010. To get the ball rolling, the MAA is inviting anyone to identify potential tree care projects in their own communities, and then to post those project ideas on the Arbor Day link at www.MassArbor.org. They hope to get ideas from all 351 Massachusetts cities and towns by January 15. From that list, MAA members and member companies will choose projects for their own Arbor Day of Service volunteer effort. This is a great way for professional arborists to make a contribution to the civic good, and for cities and towns to reap the benefits of a concerted professional effort. 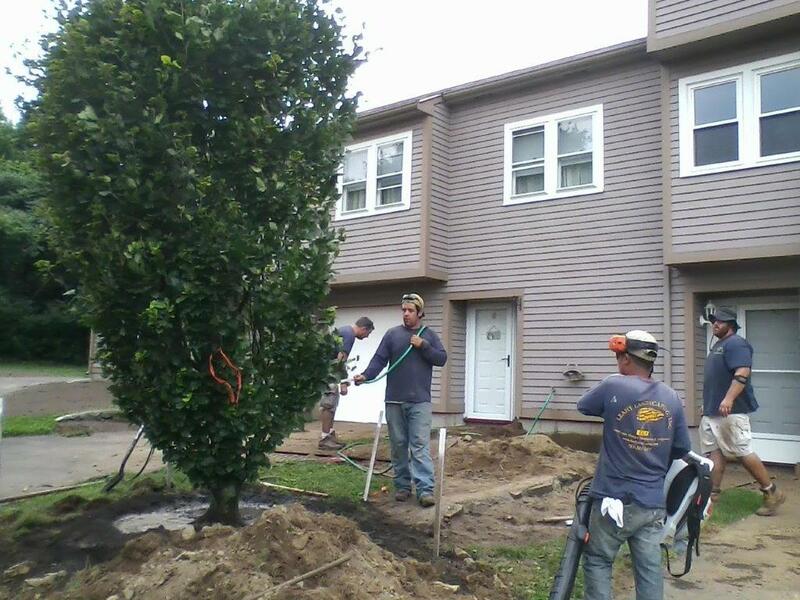 Safety pruning, tree planting, hazard tree removal, ornamental pruning — a community you drive through daily may have the project that’s perfect for your company to tackle on Arbor Day. To submit a project for Arbor Day of Service consideration by the MAA arborists, visit http://www.MassArbor.org by January 15, and click on Arbor Day. Help younger generations grow up with the Arbor Day of Service. 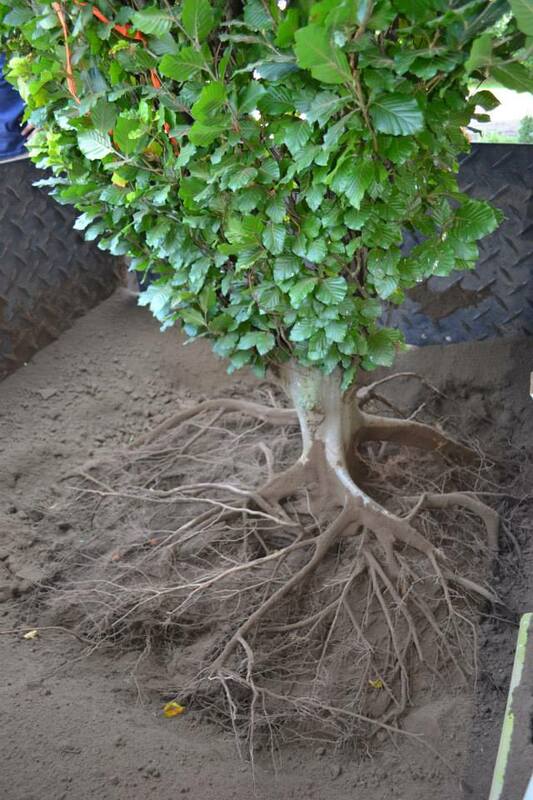 The Massachusetts Arborists Assocation bare-root workshops — one in August 2008, and one in August 2009 — have been spreading word through the Commonwealth about the benefits of air-tool tree transplanting, and word is travelling throughout Massachusetts horticulture circles now. 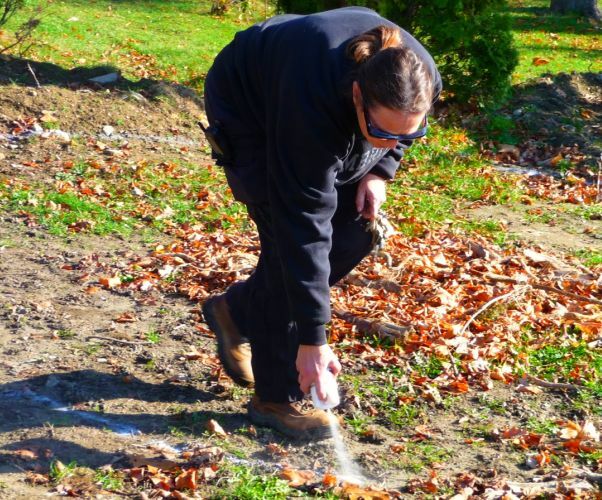 A couple of weeks ago I was chatting with Kristen DeSouza, one of the horticulturists at the New England Wild Flower Society‘s Garden In The Woods, and she mentioned that she had passed my name along to Sonia Baerhuk, who tends the grounds at Watertown’s Perkins School for the Blind. Kristen told me that Sonia and her crew have been using air tools to transplant trees on the school’s grounds for the last several months, and suggested that I get in touch with her. And so last Thursday, a couple of emails and a phone call later, I pulled in to the visitor’s parking area at the Perkins School. Sonia soon arrived in one of the grounds department’s Gators. She very kindly showed me around the campus, explaining that a new and large building project had required the removal of dozens of large trees. It’s a scenario typical of many institutional sites: a program outgrows its home, the phasing of a master plan leads to a shifting of facilities or the construction of a new building, and the vegetation on site must either be removed or relocated. Having worked at Perkins for several years, Sonia was no stranger to this course, of events, but still, she had been dismayed to see so many large specimen trees being cut and fed into the chipper. 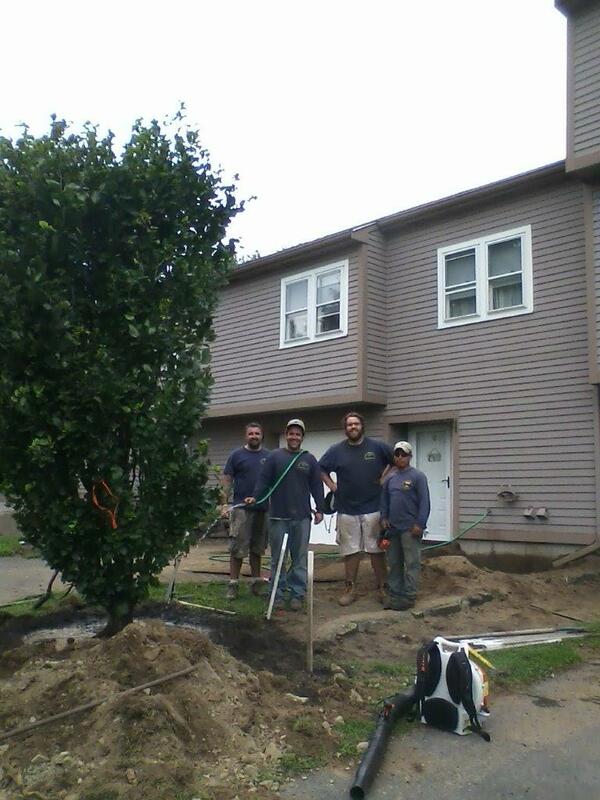 Though the grounds crew does most of its own tree work, over the years they have called in arborists for their expertise, and Sonia knew and trusted Matt Foti’s expertise. Matt had told her about the air-tool method, and on the strength of his recommendation, she signed up for the MAA’s Elm Bank bare-root workshop this past August. At it, she absorbed as much information as possible. 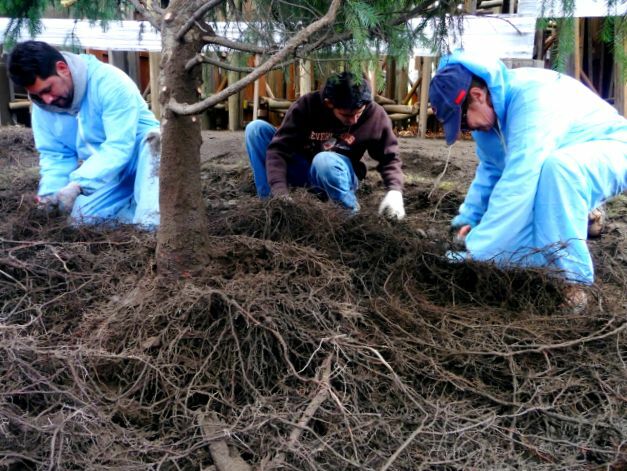 She came away from the day’s event convinced that air-tool excavation and transplant was the best way for her crew to relocate any salvageable campus trees. 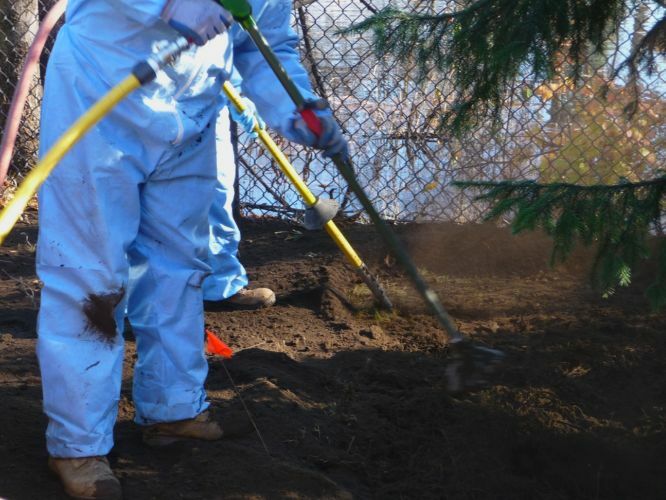 So Sonia and her boss Rich Falzone equipped the crew with an Air Spade and an Air Knife, coveralls, eye protection, ear protection, and respirators, and began to direct the relocation of trees. To date, the Perkins crew — Sonia Baerhuk, Rolando Ortega, Mynor Tobar, and Santo Masciari — has moved several 15-20′ Norway spruce, a fastigiate white pine, a Forest Pansy redbud, several apples, and a beautifully structured 25-30′ tall Halesia. 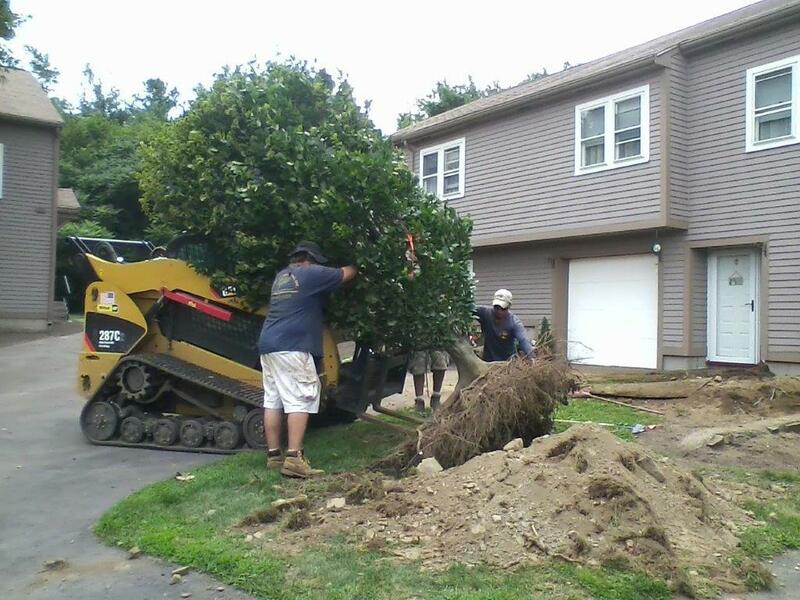 On the day I visited, they were ready to move another Norway spruce from a location that is slated to become a pondside patio. Its new home would be a lawn next to a parking lot to which they had already moved a number of evergreens. The new planting is beginning to screen the lot from adjacent buildings; over time, this grove will shade the parking lot and the walkway near it. Sonia Baerhuk marking the new home of a 15' Norway spruce to be relocated. 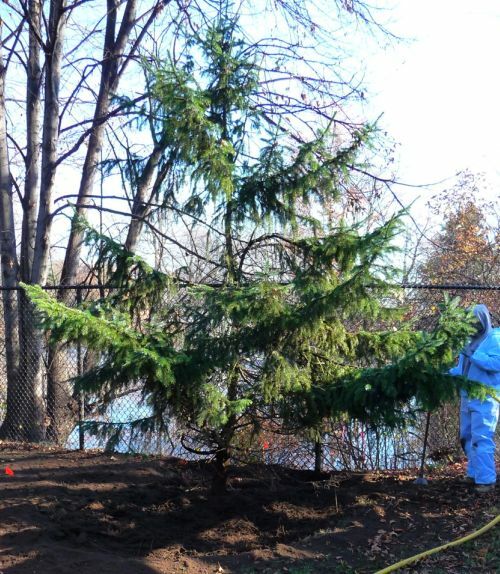 Fifteen-foot Norway spruce in its original location next to the campus pond. The crew discovered that the Norway's roots were interwoven with roots from other nearby trees. This tree was flat on the side facing the fence. 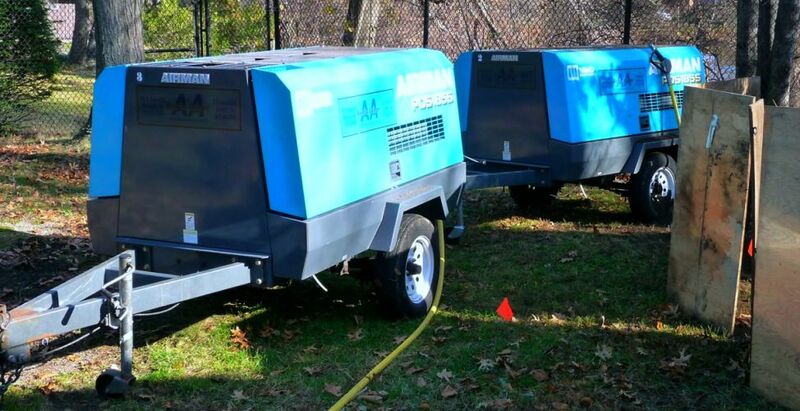 Currently, the grounds crew rents compressors. These two generated air for an Air Knife and an Air Spade. Note the plywood barriers set up to prevent soil overspray onto the lawn. 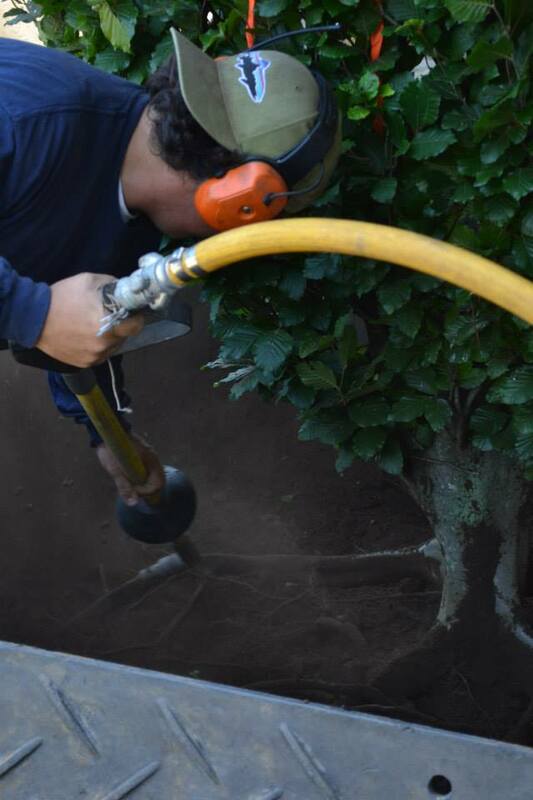 In this project, the crew did not dig a trench to hold blown-out soil; they simply started blowing soil out from the trunk and followed the roots out to and beyond the dripline. Sonia and Rolando, kitted out in their PSE: coveralls, gloves, hats and hoods, ear protection, eye protection, and respirators. Blowing soil off the roots took about three hours. 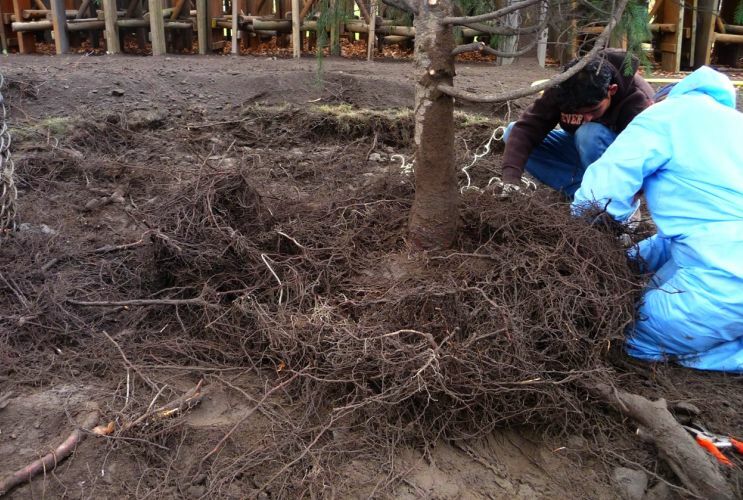 Sonia likes to divide the root mass diameter into quadrants and work systematically, while Rolando prefers to work all around the tree; when they work in tandem they use whichever method fits the site conditions best. Edges of the original B&B root ball are barely visible here; it was roughly 24-30" across. Rolando and Sonia discovered the wire basket still around it. They also discovered that the root flare sat several inches down in the original root ball. The spruce was anchored with a thick mat of fibrous roots; the crew found virtually no roots larger than 1/2" in diameter. 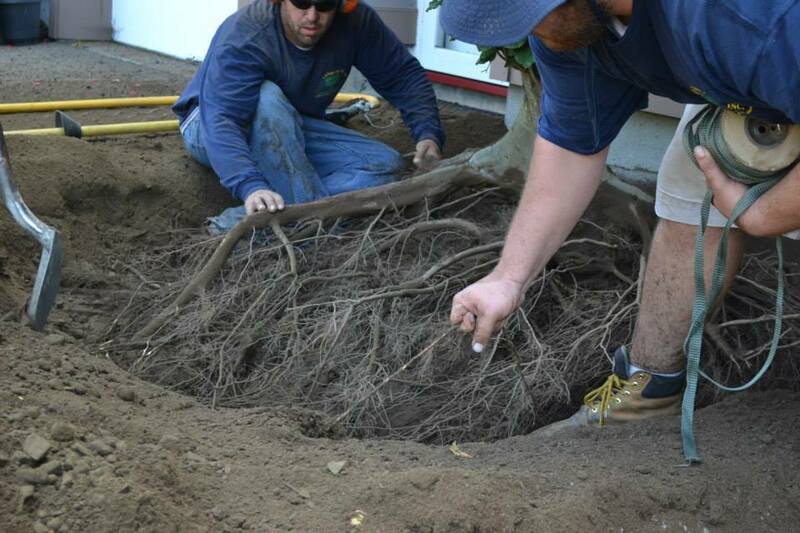 Here, they are pruning root ends under the eighteen-inch deep mat. 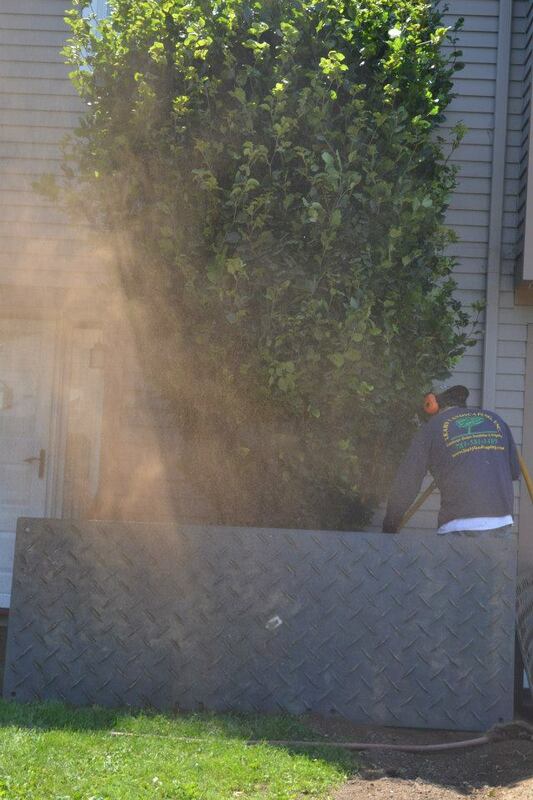 Still pruning the mat, and rolling it up toward the trunk to blow soil out from under the tree. The root mat rolled up and bound in burlap for further blowing-out and moving. Mike Furgal, the original developer of the air-tool bare-root transplant method, has patiently reviewed my articles and given thoughtful and well-considered answers to all my questions. 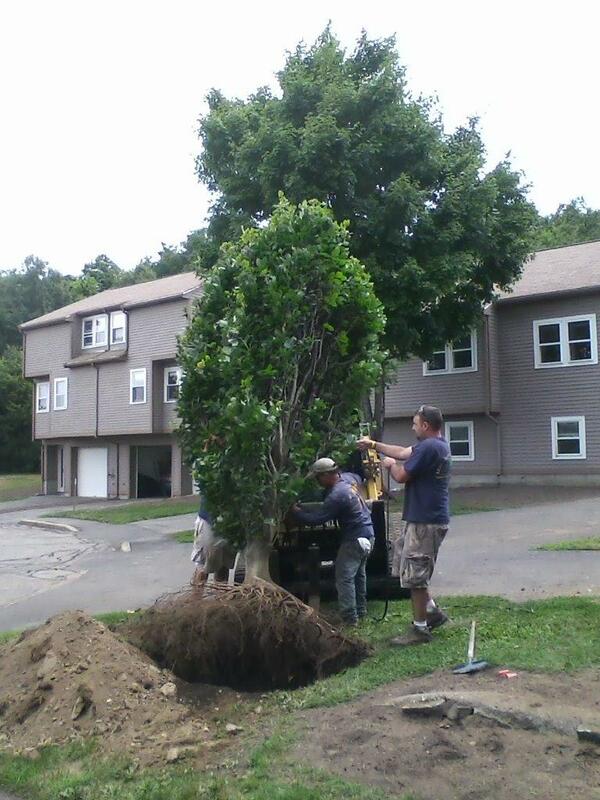 He has a tremendous amount of knowledge about trees and transplanting, and he is extremely generous in sharing it. Matt Foti, who hosted the first MAA workshop on air-tool bare-root transplanting (given by Mike and Matt) at his nursery at Nonset Farm, has taken the time to discuss a wide range of tree-related issues with me, and to provide clarifications to help make this information as up-to-the-minute and accurate as possible. He has been the catalyst to get word of bare-root work out to the MAA and beyond, and has put energy and dedication into practicing, experimenting, and teaching. Another generous guy. Carl Cathcart, Consulting Arborist, has provided encouragement and still more information to me from the day we met at the Nonset Farm workshop. 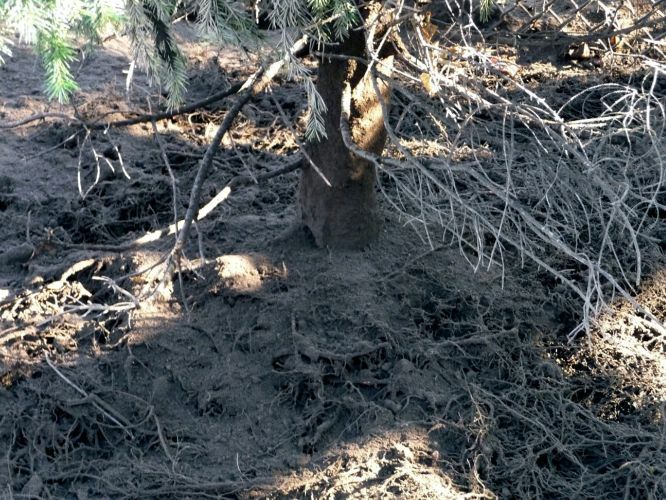 He alerted me to the Cavicchio’s root-washing experiment, he talks up my writing to other arborists, and his encouragement is what got me writing about this stuff in the first place. For all these reasons, I offer my sincerest thanks to Mike, Matt, and Carl. They are models of generosity, and I couldn’t be more grateful.